Unlike Texas Basketball, football, track and Baseball there are very few books or research material that discuss Longhorn diving. I hope with time this site can add some historical insight and tell the full and compelling story of the Texas diving tradition. This page will take more time to build. WETS (Working Exes for Texas Swimming) was organized in 1968 when a group of former Longhorn swimmers, divers and coaches, headed by Tex Robertson, met to promote University of Texas aquatic excellence. The initial goals of WETS were to: Honor the past accomplishments of UT swimmers and divers; Promote the present and future success of Texas Swimming and Diving; and to Provide a common forum for all former Texas swimmers, divers, coaches and fans to gather and stay connected. Their site information is listed below. The diving well at the Lee and Joe Jamail Swimming Center is named for a former Longhorn who many consider the greatest diver of all time. When the nation's finest collegiate men's divers gather for the NCAA Swimming and Diving Championships at the Lee and Joe Jamail Swimming Center this weekend in Austin, they will be entering hallowed ground—or hallowed water, if you will. That's because the diving well at the center is named for a former Longhorn who many consider the greatest diver of all time, and who was as good in his sport as was any athlete in UT history. David "Skippy" Browning was born in Boston in 1931 and started diving when he was four years old. By the time he got to the university in the late 1940s, he had entered his first competition as a diver at the age of ten. By the mid-1950s, he had won a dozen AAU and NCAA championships, and he had dominated the 1952 Olympics. At the 1952 US Olympic Trials in New York, Browning won the competition by 100 points. Browning, who moved with his family to Corpus Christi when he was three, grew up in Dallas and began competing under the tutelage of his father. Legend has it that he was turned down for an athletics scholarship at Texas and he started his collegiate journey at Wayne State in Michigan. That was before, so the story goes, that a rising young Texas supporter named Frank Erwin arranged for him to get a scholarship at UT. Browning transferred, and the rest became history. In a time when NCAA diving was dominated by Ohio State, Browning became the nation's hope to break the Buckeyes' lock on the podium at the diving events. As a sophomore, he finished second by .06 points to Ohio State's Bruce Harlan, and there began an unmatched rivalry between the two. At most meets, they swapped first and second place regularly, leaving the rest of the field behind. Harlan edged Browning for a spot on the team and won the gold medal at the London Olympics in 1948, but by 1952, Browning had surpassed him. Judges called him "No Splash" because of what they termed his "phenomenal ability to knife into the water without a splash." Others credited his remarkable ability to adjust a dive in the air to a peripheral vision that was so phenomenal that diving against him was "no contest." It was at 1952 Olympic Games in Helsinki, Finland, that Browning won the admiration of the world with his amazing gold medal winning performance. Browning was so impressive, some who knew the sport well said that the sport-crazed Russians actually trained seven cameras on his every move to study him in an effort to emulate his success. "They watched everything from how he prepared before a dive to how he toweled off afterwards," said a former coach. During his Texas career, Skippy was named All-American in 1950, 1951 and 1952. In all three years, he won the Southwest Conference diving championship on both the one-meter and three-meter boards. He dominated the sport as no other had ever done. He went undefeated in every SWC dual meet. Included in his success were eight AAU national diving titles and four NCAA titles. In the spring of 1952 at the intercollegiate competition at Yale, he was given a perfect score of ten on a cutaway 1-1/2 pike, rated one of the most difficult of dives. He made up his own special dives and the AAU rules committee officially adopted some of them. Popular on the campus because of his good nature as much as his athletics skills, he was named a "Goodfellow" by the Cactus Yearbook in both 1951 and 1952. The 1950s, however, were way before endorsements made it lucrative to be an athlete. Skippy graduated from UT with a degree in business administration in January of 1953. By then, he was married (to Corinne (Cody) Couch; Sept. 7, 1950), and he chose to enter the U.S. Navy. He received his pilot's wings as a Lt. JG in June of 1955. In the spring of 1956, he was two weeks away from beginning his Olympic training for the Games in Melbourne, Australia. Stationed in California, he was on a cross country training flight in his AFJS Fury, an aircraft carrier jet. In a field near Rantoul, Kan., Browning died when the plane crashed. He was 25 years old. As the world mourned his loss, accolades began to pour in. He was named to the Helms Athletic Foundation Hall of Fame in 1957. In 1960, he was inducted into the Longhorn Hall of Honor in a class that included Dana X. Bible, Jack Gray and Ernie Koy. He was named to the Texas Sports Hall of Fame in 1962. In a medium that Skippy Browning could have only imagined, there are actually clips on the Internet of a few of Browning's dives. There is no record of what happened to the film from the seven Russian cameras, but despite placing three divers in the top nine in the springboard, the Soviets did not win a medal. What Skippy Browning proved so long ago was that diving is an art. In its own way, it is the freeform of humanity, twisting and turning in time so as to create the perfect entrance into the bright blue water. And as the young men of this 21st Century mount the board for their flight, it is not only excellence that they are pursuing. In the diving well at Texas, it is the memory, and the image, of perfection. 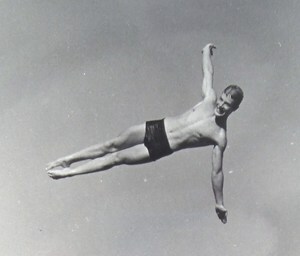 1950-1952 Browning was the best springboard diver in the world. He won eight national AAU diving championships, two NCAA crowns, and he was honored as a three-time All-American (1950-1952). In the 1952 Helsinki Olympics he was the gold medalist He is a member of the Helms Hall Diving Hall of Fame, a 1962 inductee into the Texas Sports Hall of Fame, and The University of Texas Longhorn Hall of Honor. At 25 he was killed in a Navy jet crash. Horns Up!! Appointed the diving coach for the 1964 U.S. Olympic team. For almost 50 years he dedicated himself to teaching P.E. and swimming at UT. Coach Mike Brown takes Texas diving to national prominence. Coach Brown was SWC Coach of the Year in 1976-AAU Director 1977 and 1980- Three of his divers earned spots on the Olympic team. A legendary diving coach at the University of Texas from 1976-1994, Brown was named National Diving Coach of the Year three times and was part of 14 national championship and 31 conference championship teams at UT. While in Austin, Brown coached 28 all-Americans, seven individual national champions, 18 national team members, five Olympians and served as a diving coach at the 1988 and 1992 Olympics. Diving team is composed of two members from Sweden and one from Canada. Four members of the diving team qualify for the 1978 AAU national championship. Beiter, Your , Christensen, and Lilgeber represented UT well. Matt Scoggin is a diver for Texas under Coach Mike Brown. Matt will become the Head Diving Coach at Texas in 1996. Men's team in 1981 placed 3rd at the SWC meet. David Lindsey is the only men's diver to be invited to the National meet and Erin Beiter was the only Longhorn diver that made the national meet. Scoggins became part of diving history when all three judges awarded him a perfect 10 on a dive. Coach Brown is diving coach of the year for the 1982-1983 season. The 1986-1987 divers are part of the Horns 4th National Championship. Qualifiers for the NCAA championship were Hallee, Overmyer, Caron Arnold, and Tollan. At the SWC meet all the Women divers made the finals. The 1988 women's diving consisted of three sophomores and two freshman and Coach Brown thought it was his best team in a long time. All the women qualified for the zone meet. The men sent two divers to the NCAA meet.- Kurt Bubnis and Christian Sryen . 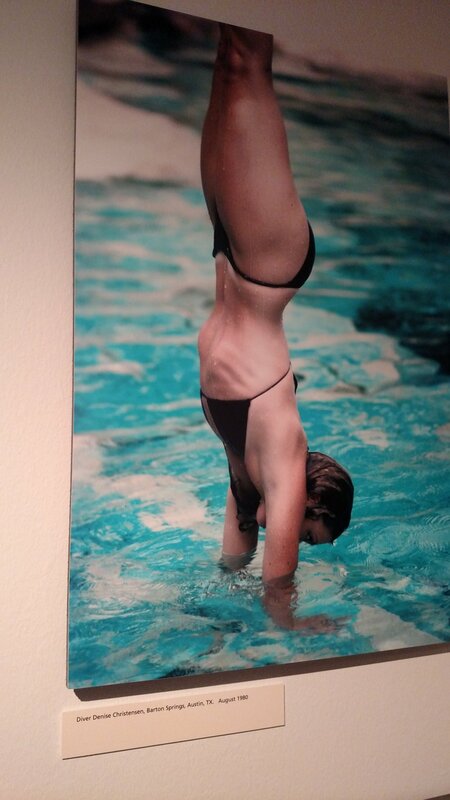 In 1989 women divers contributed to the 7th SWC championship . Jenny Green , Patty overmeyer and Kelly Jenkins led the team. The women placed second to Stanford at the national meet. Jason Rhodes (3-meter dive) captures individual National title championship . Mike Brown said the 1990 women’s team was one of his best . The points scored in diving helped the swimmers win the national championship . Jenkins and Overmeyer were invited to the national meet. Two men also qualified for Nationals - Brandon Gardner and Jason Rhodes. Jason Rhodes is national champion in the 3 meter spring board. Brandon Gardner finished 6th. In the SWC meet Rhodes becomes the first Longhorn to sweep all three diving events. Steve Page and Sam Arieff are the leaders of the diving team. Divers help the swim team win the 14th consecutive SWC. Arieff places 33rd and Page is 34th at the national championship in the one-meter springboard. Women have a great diving year. In the 3 meter national standings Robin Carter places 2nd , Terri Seipel 8th, and Sherry Wigginton 11th. In the platform Wigginton takes 5th , Carter 7th ,and Seipel 8th. Coach Matt Scoggin joins Coach Reese as the diving coach. He also was the olympic diving Coach in 2000,2008, and 2012. Vera Ilyina wins the National Championship in the 1M and 3M dives in 1997 and 1998 , receives a NCAA post-graduate scholarship, is an Academic All American and a All American 4 times. Laura Wilkinson wins the National Championship in the platform in 1997 and 1999. All American 6 times and Olympic Medalist 2000, 2004, and 2008. Troy Dumais claimed individual gold for the third-consecutive year on the three-meter springboard event and second consecutive crown on the one-meter springboard. Troy Dumais (see diving page on this website) won individual titles on both the one-meter and three-meter springboards during the meet to close his career with seven total championships. With his victory on the three-meter, Dumais became the first diver in NCAA history to win four straight years in an event and also joined an elite group of nine swimmers to ever win an individual national title four straight years. Troy Dumais won individual titles on both the one-meter and three-meter springboards during the meet to close his career with seven total championships. With his victory on the three-meter, Dumais became the first diver in NCAA history to win four straight years in an event and also joined an elite group of nine swimmers to ever win an individual national title four straight years. Emma Ivory Ganja is an Academic All American.